10 Tips on Tank Preparation for the Winter Season - Superior Tank Co., Inc.
Winter is a great time to prepare your steel water storage tank for the next season. An inspection and preventative maintenance can make a significant impact and keep your steel storage tanks in service through next summer and fire season. During an annual inspection there are various areas of the water storage tank which need to be examined. Corrosion of the steel water tank shell, storage tank components or tank hardware can result in unexpected storage tank leaks and water waste. In extreme circumstances, corrosion of the steel tank shell can result in water tank failure. Detecting and correcting any corrosion will prevent steel loss and maintain water storage tank integrity. In the winter, insects and animals seek shelter from the weather and water storage tanks provide a great winter home. Damaged or missing screens on roof vents or overflow piping can allow insects and small animals access to the interior of the ground storage tank. Once inside the water tank, an animal or swarm of insects can negatively impact water quality and can lead to the potable water tank being taken out of service and/or a boil-order advisory being issued. In addition to inspecting bolted tank roof vents and overflow piping, storage tank roof hatches and shell penetrations should be examined. Roof hatches without a sufficient perimeter barrier can allow roof runoff to flow into the storage tank resulting in contamination. If roof penetrations for cathodic protection and Supervisory Control and Data Acquisition (S.C.A.D.A.) systems are not sealed correctly, steel loss from corrosion can occur and roof runoff can enter the steel tank, contaminating the water inside the tank. If needed, frost-free tank roof vents can be added to ensure proper operation in cold water. Checking that the ground storage tank liquid level indicator is accurate and all parts are in good condition can prevent future problems and conflicting data. If the storage tank liquid level indicator is not operating correctly, an accurate water level cannot be determined. Even with a water storage tank S.C.A.D.A. system in place, the liquid level indicator provides a simple and fast cross-check. Sediment build up on the potable water storage tank bottom can seem harmless, but over time accumulation can result in significant issues. The sediment can harbor thriving pathogens or biofilm where they are protected from disinfectant. When the sediment is disturbed, the pathogens will be passed downstream from the water storage tank to end users. Inclement winter weather can result in dangerous conditions around water storage tanks. Inspecting current equipment or adding/upgrading safety systems can significantly reduce the risk of employee injuries. Basic equipment such as interior and exterior tank ladders and roof tie-off points should be inspected to ensure components are intact and firmly attached to the storage tank. Upgrades to safety equipment include fall prevention equipment for steel tank ladders and OSHA compliant roof mounted guardrails which encircle the entire perimeter of the ground storage tank. Inspecting the water storage tank before the majority of winter weather occurs will allow a comprehensive steel tank foundation evaluation. The ground storage tank foundation can be reviewed for signs of erosion or water accumulation and corrective measures can be taken. Ensuring that the foundation of a welded or bolted tank is stable can prevent unexpected water storage tank failure. In addition, seismic upgrades to the foundation and steel tank anchoring system can be implemented; increasing the water tank’s survivability in an earthquake. Lower water demand in the winter time can result in decreased water cycling and water remaining in the storage tank longer. If thermo-stratification, water short circuiting or water quality degradation becomes an issue, a mixing system specifically designed for the potable water storage tank can be installed. A basic water tank mixer can be very affordable and result in uniform water age and superior disinfectant distribution thereby maintaining water quality. A coating assessment is recommended for bolted steel and welded steel tanks to estimate the amount of coating life remaining. During the coating assessment, a variety of tests can be performed on the steel tank including visual inspection, ultrasonic testing, lead/chromium detection, coating adhesion testing and a coating composition test. Any coating damage can be spot repaired if the remainder of the storage tank coating is intact. Predicting the remaining coating life, allows for planning and budgeting of coating renovation, reducing unanticipated large expenses. After the condition of the steel water tank has been reviewed, a storage tank service plan can be developed. Repairs and preventative maintenance to bolted steel and welded steel tanks can be prioritized and planned, reducing expensive emergency repairs. Storage tank maintenance requiring water tanks to be taken out of service can be scheduled for lower periods of water demand. In addition, larger capital expenditures can be planned for thus avoiding budget shortfalls. 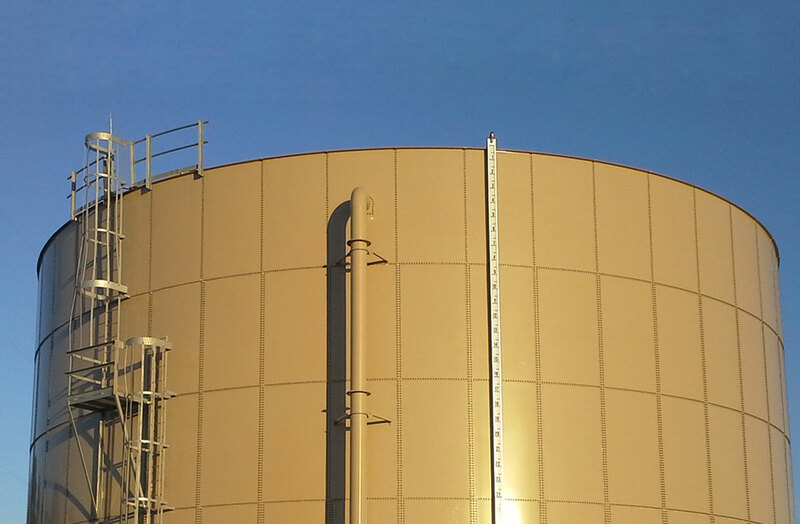 After the condition of the storage tank has been assessed our Annual Maintenance Plan (AMP) can be discussed. Our AMP is a simple way to incorporate the various aspects of water storage tank maintenance into a single contract with one low cost annual fee. With our Annual Maintenance Plan, expenses are known years in advance and the quality of the work is guaranteed. Schedule your tank inspection before December 31, 2016 and save! Previous No “Tail-Light Warranty” here!